This loaf has gone through multiple tweaks and turns before I was happy with the resulting moist tasty loaf. We have had caramelized apples (recipe here) cluttering up the fridge and containers of loaf in the pantry, freezer and chook bucket. 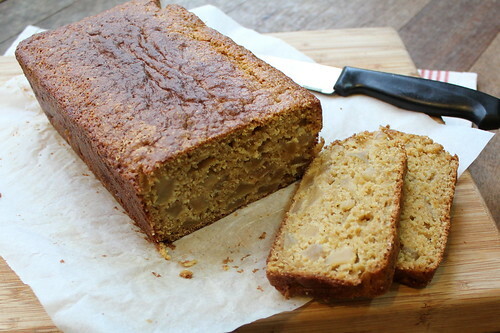 The loaf is a good lunch box filler – serve it as is, or lightly buttered. Preheat oven 180ºC / 350ºF. Grease & line a 23 cm x 13 cm loaf tin (9″ x 5″). Place eggs, unsweetened apple purée & raw sugar in a large bowl. Beat until the mixture is incorporated together. Place the yoghurt into a clean medium bowl. Stir in the baking soda and set aside (it will bubble & fizz but that’s all good). Sift together the wholemeal flour & baking powder. Tip any wheat husks caught in the sieve back into the flour. Add the caramelized apples to the flour mixture and toss to coat the apples in the flour. Combine the egg mixture, flour mixture & yoghurt mixture and stir until all mixtures are combined. 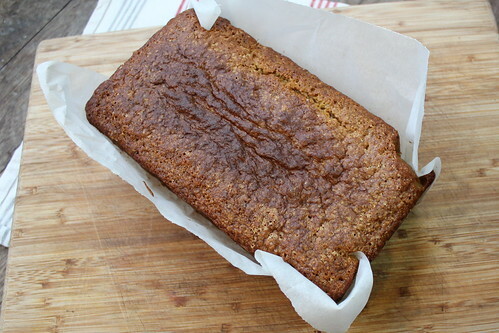 Pour into prepared loaf tin and bake for 55-60 minutes, or until a cake skewer comes out clean. Allow to cool in the tin for 5 minutes before turning out onto a cake rack to cool completely. Store in an airtight container. Eat within 2-3 days. 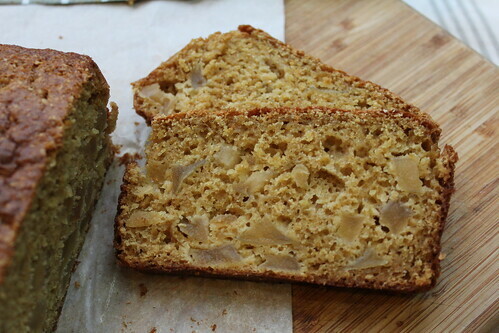 This entry was posted in Baking, Loaves and tagged Caramelized Apples, Loaf, quickbread, whole wheat flour, Wholemeal, Wholemeal flour, Yoghurt & Caramelized Apple Loaf by Jo Dohrman. Bookmark the permalink.